The Amsterdam museum Micropia won an award for most innovative museum of Europe and it is well earned. Micropia museum shows the unnerving yet fascinating world of microbes: the life form that is all around us, but invisible. The museum uses a lot of digital gadgets that make the strange world of fungus, microbes, bacteria, algae and parasites come alive in a fun and educational manner. The journey to life’s smallest parts starts in an eerie elevator, where our bodies are reflected on the ceiling and and as we move up slowly, the video zooms in in our faces, right down to animations of the mites and skin cells, bacteria and the viruses on those bacteria. The museum then welcomes you into this strange new world and gives you a peek inside, and not only by microscopes. The Kiss-o-Meter counts the amount of bacteria you exchange when you kiss. A interactive body scan machine shows you how many of these small organisms inhabit your own body (many!) and for what purpose: how they affect my behavior, train my immune system, digest my food, and protect me from disease. Couples learn how many bacteria they exchange when kissing with the Kiss-o-Meter. Fascinating is also the ant colony, busy with the things ants are always busy with. They cut off large pieces of leaf and carry it on their backs to their den, made visible through glass. Downstairs you can see some of the positive ways humans can make use of microbes: to make food (yoghurt, bread! ), bioplastic and cleaning material by letting ‘good’ bacteria fight the bad ones. 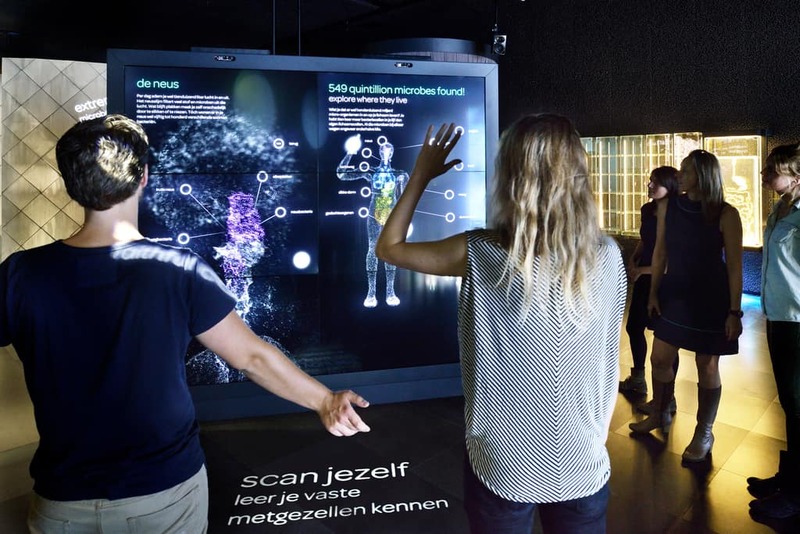 There is a lot to learn at the Amsterdam Micropia Museum, the first museum in the world dedicated to the world dof micro organism. Amsterdam Museum Micropia is located next to the Amsterdam Zoo Artis in the Jewish Quarter. Metro, Waterlooplein stop (10 minutes walk).